Eugene Kramer, age 89, of Hector, passed away Wednesday, January 03, 2018, at the Buffalo Lake Healthcare Center. Mass of Christian Burial will be held Monday, January 8, 2018, at 10:30 A.M. at St. John’s Catholic Church in Hector. Interment will follow in the church cemetery, with Military Honors provided by the Carl O. Potter American Legion Post 135 of Hector. Visitation will be held Sunday afternoon, January 7, 2018, from 2:00 P.M. – 6:00 P.M. at the Hughes-Hantge Funeral Chapel in Hector, with a 5:30 P.M. Prayer Service. Visitation will continue on Monday at 9:30 A.M. at St. John's Catholic Church, for one hour prior to the Service. PLEASE NOTE CHANGE OF LOCATION FOR VISITATION ON SUNDAY. Eugene Francis Kramer was born in Bird Island, Minnesota, the oldest of 12 children born to Frank J. and Lucy (Dummer) Kramer. He was baptized and confirmed at St. Mary’s Catholic Church in Bird Island. Eugene attended country school in Osceola Township. On February 22, 1951, Eugene was inducted into the United States Army. During his service, he and his fellow soldiers built Camp Desert Rock in Yucca Flats, Nevada, which was used for atomic testing. These soldiers were qualified as atomic veterans. After Eugene was honorably discharged on February 21, 1953, he returned home and started his farming career. On September 11, 1954, Eugene was united in marriage to Carol Jean Current at St. Mary’s Catholic Church in Bird Island, Minnesota. They made their home in Brookfield Township north of Hector where Eugene continued farming. They lived for a time in Osceola Township, and moved back to Brookfield Township. Their marriage was blessed with eight children who have in turn given them much happiness with grandchildren and great-grandchildren. After Eugene and Carol moved into Hector in 1986, Eugene’s love of farming kept him working with his sons. Eugene and Carol loved to go dancing, and they liked to play cards and travel. They spent winters in the South, and much time at their lake home in Paynesville. They moved to Buffalo Lake in 2016, and shared 63 years of marriage. 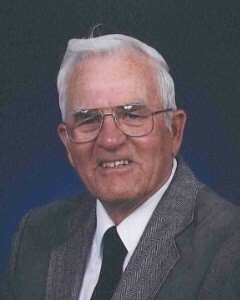 Eugene was a member of St. John’s Catholic Church in Hector. He belonged to the Catholic Order of Foresters, and the Knights of Columbus. Eugene was a member of the Carl O. Potter American Legion Post 135, and for many years dedicated his time with the group providing military honors as they laid their comrades to rest. Early Wednesday morning, January 3, 2018, Eugene passed away at the Buffalo Lake Healthcare Center, having reached the age of 89 years, 6 months, 27 days. Blessed be his memory. Eugene was preceded in death by his Parents, Son Scott Kramer, Brother Francis Kramer, Nephews Justin Kramer and Danny Kramer, Parents-in-law, Lester and Lela Current, Brothers-in-law, Stanley Carda, David Muesing, and Galen Current, Sister-in-law Delores Kramer. My condolences to the Kramer family. So sorry for your loss. I will miss his dry sense of humor and quick smile.